It's coming up to 6am and I am still stuck watching Criminal Minds (CM). I'm at Season 2 right now and I am hooked. In this series, the Behavioral Analysis Unit is composed of an elite team of FBI profilers. Their task is to analyze the most twisted criminal minds; anticipating their next moves before they can strike again. B has been watching CM with me too and I daresay he's just as hooked! Lately, I've been catching up on all the great series that I've missed on TV. I recently got hold of a huge DVD stack from a friend so after months of being in the dark; I'm finally caught up with Lost, Grey's Anatomy, Nip Tuck, and Prison Break! The only series we have yet to watch is Heroes. B and I are almost afraid to resume our fascination with Heroes. After the last season we watched, it just got more confusing and mind-boggling that it's going to take some time before we're ready to tune back into the weirdness going on there. So right now I guess it's back to boring basic cable for us! nite nite dearie.. esok nak gi vet.. Awan tak sedap perut.. tummy ache it seems..
eh i mean later .. lol! 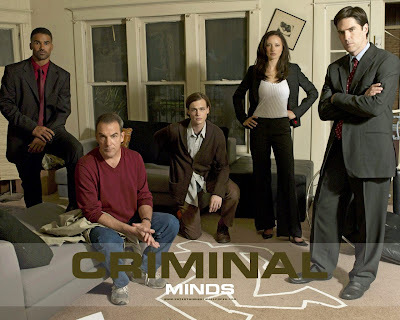 Criminal Minds is my fave tv show!! Isn't it awesome??? I really need to watch more tv LOL!!! I know, Marzie! Doesn't it make you wonder how many unreported psychos are there in our world? U already have direct tv Ayie?? Of coz it does Debbs and it also makes me scared to go to the loo now oh no! Heheheh! U watched till which season?? Ohhhh I’m almost done with season 2…got season 3 oso kan? He he! i don't watch much TV these days except the news and AI. my hubby and kids are obssessed with TV though.